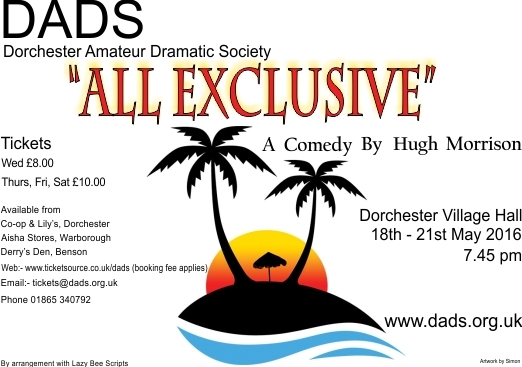 ‘All Exclusive’ by Hugh Morrison was performed by DADS (Dorchester Amateur Dramatics Society) 18th – 21st May. A package holiday that is somehow less than perfect is perhaps within the experience of most DN readers but being caught in no-man’s land between rival armed forces and having to hide from their tanks is a mercifully rare occurrence. It is in this context, however, that Hugh Morrison has set his very amusing comedy about ‘the British’ abroad and class war between the ‘working man’ and the self-styled ‘intellectual elite’. The action takes place by the pool of Las Cantatas Hotel on the Central American island of San Itairi. This clever use of just one set kept the pace flowing while the ‘Solarflair’ holiday company rep, Trisha Heddy (a clever caricature created by Jane Brooks) made sure that everyone was fully aware of all the entertainments on offer in other parts of the ‘all inclusive’ resort, where the buffet was open all day but only served food at meal times. The play opens with Ian Hurst (Mark Williams) – a London-based art critic who has just interviewed the celebrated local conceptual artist Miguel Corantes – complaining about the hotel to his office. The call is cut short by the arrival of a new group of ‘chavs’ (as Hurst calls them). 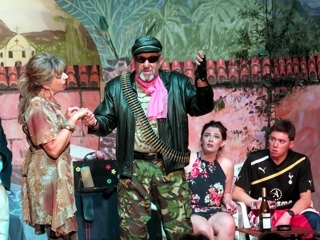 Angie Belper and Pauline Beswick (the chavs) are brilliantly played, respectively, by Christine Jones and Sue Kitson – two well-established DADS members with distinguished cvs – immediately followed on stage by DADS debutants Lois Axenderrie and Dominic Flanagan in the roles of courting couple Karen Kay and Steve Trout – two very welcome additions to the DADS talent pool. It is clear that Hurst has nothing in common with these new arrivals. Karen, however, is studying art through a WEA course and when she realises that Hurst is not only the writer of one of her set books but has also just met Corantes, one of her heroes, she is deeply impressed. Somewhat overwhelmed by the attention he is receiving from this pretty girl, Hurst (another role that further demonstrates the versatility of Mark Williams) responds in a way that annoys Trout and the hostility between the two men is a thread that binds the rest of the story together. Much of the play’s comedy is centred upon Angie and Pauline – the archetypal Britons abroad. Angie is worried about having to eat foreign food so her suitcase is full of English delicacies such as pizzas, burgers and ‘Vesta’ curries. For Pauline the main concern is that there should be space in the luggage to take home a plentiful supply of duty free cigarettes and Scotch whisky. For Trisha – the long-winded rep with a preference for using three words where one would do – these are the holiday-makers from hell. Angie and Pauline have strong views about bathroom hygiene, carry cameras at all time to record ‘evidence’ and have Watchdog’s ‘phone number in their handbags. Angie is clearly attracted by Ian Hurst but is disappointed to learn that he lives in a flat near Wimbledon Common while her home in Macclesfield not only has its own off-street parking but also a conservatory, just like all the houses in her smart street. Ian is keen to return to London as soon as possible but the airport is closed due to industrial action and he is forced to remain at Las Cantatas. The political situation on the island rapidly worsens so that by the next day this incongruous group is forced to remain uncomfortable in each other’s company. Even Trisha has no further information for them at this time. Soon the rumble of tanks is heard and the group finds itself in the middle of a battle between the fascist government’s troops and the supporters of the worker’s party, the side which Ian Hurst tells them he supports. At this point there are spectacular special effects created by Simon Ratliff, which are brought to an end when the worker’s party claims victory and the arrival on stage of Miguel Corantes (Ed Metcalfe) resplendent in classic revolutionary battledress complete with machine gun and dark glasses. This is a role in which Ed Metcalfe carries off with great authority and presence. In fact it is easy to see why the new workers’ party government would have made him Minister of Culture. Miguel’s invitation to spend the rest of their holiday at the Presidential Palace, with its private beach, banqueting hall and huge wine cellar, means that Angie and Pauline will have no further cause for complaint and Trisha can take the rest of the day off. Rachel Winslet-Morris, who is well-known for a string of very successful starring roles in past DADS productions, decided to broaden her experience by directing ‘All Exclusive’. Her casting, interpretation and management of the play cannot be faulted. Some unusual extra pressure was added to the normal directorial responsibilities with the advance knowledge that at least one of the performances would be attended by the writer, Hugh Morrison. This pressure became even more intense when it was realised that the piece is so new that Hugh had never actually seen the work performed. Previous performances in Australia, Ireland and Lancashire were not exactly convenient for a writer who lives in North London. 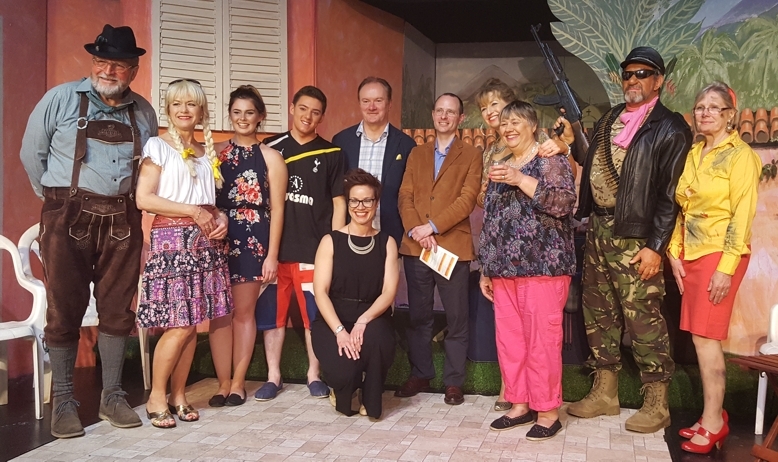 As our group shot of cast, director and writer clearly shows, the experience was clearly entirely satisfactory. I’m not surprised! Please write another one soon, Hugh.